Work on the new Frankston War Memorial has now been completed after construction commenced earlier this year. The new location was chosen due to the original site at the Frankston Civic Centre no longer being able to cope with ever increasing numbers attending the Anzac Day service each year. 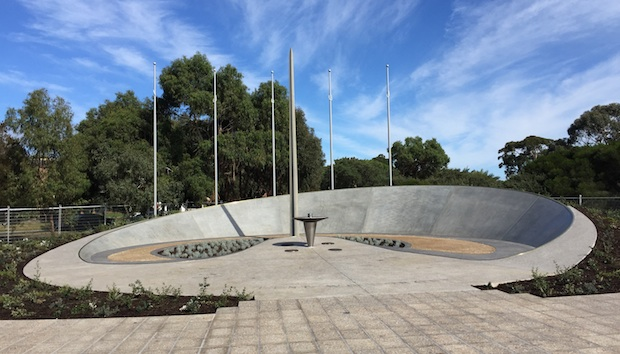 The new Frankston War Memorial is located in Beauty Park between Baxter and Spring Streets. In the past, Beauty Park was known for its association with Lord Baden-Powell and the Scouting Jamboree of 1934 and for many years the park was home to the Frankston Croquet Club prior to its move to improved facilities in Nolan Street. The project $640,000 project was funded by the Australian Government, Frankston City Council, Frankston RSL and the Women for Frankston War Memorial and community members. All features from the current war memorial at the Frankston Civic Centre such as plaques, badges, obelisk and the eternal flame will be part of the new design, while as an ongoing project, names of returned Frankston City servicemen and women will be engraved on the new memorial, starting with 200 First World War veterans. In addition to this, five brand new Abel 9m Flag Poles were recently installed. In July 2015, Council awarded Convic Pty Ltd the tender to design and construct the new Frankston War Memorial. Abel Flags & Flagpoles were contracted by Convic to manufacture & install the new 9m Flag Poles at the Memorial earlier this month in time for Anzac Day 2016. For more information on Abel’s premium quality range of flag poles and banners poles contact Les Berryman on 1300 193 714.